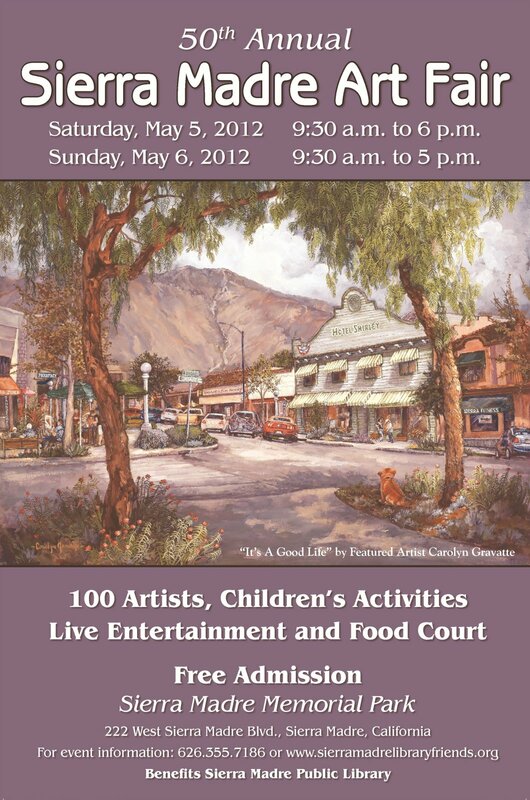 Press Release posted 4/23/12 – The 50th annual Friends of the Sierra Madre Library’s Art Fair will be held in Memorial Park on Saturday, May 5, from 9:30AM to 6:00PM and Sunday, May 6, from 9:30AM to 5:00PM. Our 50th anniversary fair will be extra special with more than 95 artists displaying and selling their fine arts during the weekend. Forty-seven of the artists have donated lovely one-of-a-kind pieces to be auctioned off in a Silent Auction which means that you’ll have a chance to bid on some really beautiful artwork. The Creative Arts Group has planned an imaginative craft activity for children from 10:00am-4:00pm both days. While you’re strolling among the various booths, you’ll be entertained by an eclectic variety of music and will be able to assuage your hunger and quench your thirst at one of the many food booths available. Live music will be featured throughout the weekend. In the band shell on Saturday the Steve Frovato duo will be playing country jazz guitar music from 11am-1pm and from 2pm-4pm Nick Ariondi will be playing accordion music with a European/American flair. On the South lawn Sister Ann and her Wayward Boys will play Celtic music from 10am-noon, the Joel Penner jazz trio will play from 12:30pm-2:30pm, and Don Ames and Gayle Blumenthal will perform folk music from 3pm-5pm. Our Sunday musicians performing in the band shell from 11am-1pm are Sudbury and Ramos on violin and guitar playing world contemporary classics with a Latin flair and from 2pm-4pm the Bruce Forman trio will be entertaining us with world class bebop and western jazz. Our guest musicians performing on the south lawn on Sunday from 10am-noon are Banna Beag Mall, an eclectic Celtic band, from noon-1:30pm we’ll feature the DRBs on two ukuleles and a bass, and from 2pm-4pm we’ll hear music performed by the Joel Penner jazz trio. Guitarist Richard Bellikoff will be featured as a strolling musician during the fair. A food court will offer a variety of food and drinks provided by local non-profit groups as well as food vendors. At press time we know that the Sierra Madre Historical Preservation Society will be selling their famous lemonade made with rangpur lime juice. There will be a Rounds Burger truck; Taquito Lover will be offering taquitos, tamales, and fruit drinks; Sophia’s Kitchen will be selling sausages, pizza, corn, hot dogs, nachos, buffalo wings, and drinks; BF Service will be serving a variety of Mediterranean food and drinks; there will be Korean and Chinese barbecue; and Corfu will be serving Greek food and drinks. And, of course, the Friends of the Sierra Madre Library will have a booth selling loaves of homemade quick breads and sweet breads. So plan to spend a day with us, enjoying artwork done in a wide variety of mediums, sitting on the grass listening to music, dining on a satisfying lunch or snack, watching the kids create their own souvenir of the Art Fair and then going back to bid on some of the items in the Silent Auction that appeal to you, and buying those lovely pieces of art that you’ve been thinking about since you saw them. 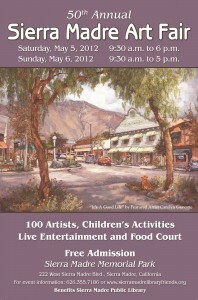 Proceeds from the Art Fair benefit the resources and programs of the Sierra Madre Library. For more information, call 626 355-7186 or visit our website at www.sierramadrelibraryfriends.org.